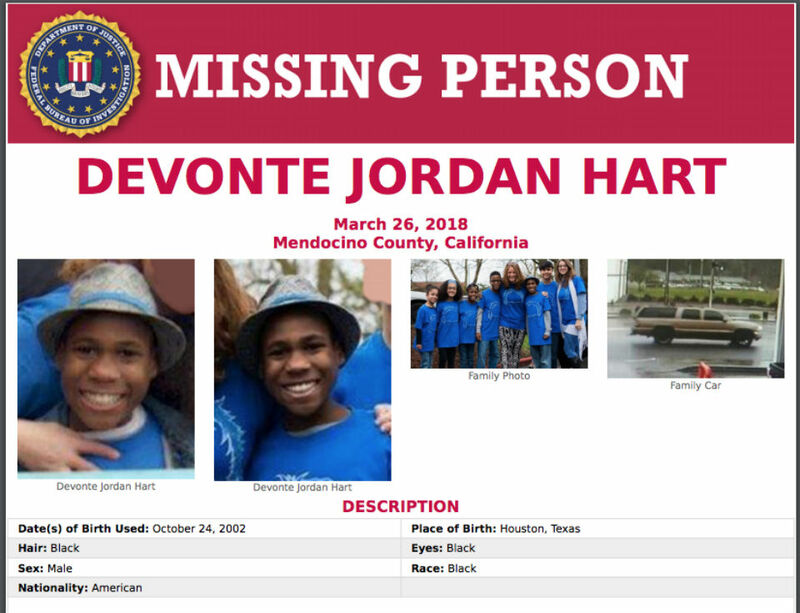 A spokesperson for the Mendocino County Sheriff’s Office has further clarified an earlier statement about his department’s conclusions regarding the whereabouts of two missing teenagers whose family members died in an apparent murder-suicide earlier this year. As CrimeOnline previously reported, Mendocino County Sheriff Lt. Shannon Barney insisted in an email last week that authorities had not conclusively determined that all six adopted children of Jennifer and Sarah Hart were in the family’s SUV when Jennifer drove the vehicle over a cliff in northern California on March 26. The crash killed six family members, including both parents and four of their adopted children: Markis, Abigail, Ciera, and Jeremiah. Devonte Hart and Hannah Hart are still missing, and authorities have not yet identified skeletal human remains found inside of a shoe that was discovered near the site of the crash in early May. When presented with statements from the sheriff’s office, made in April, saying that investigators believed all six Hart children were in the car, Lt. Barney said he did not perceive any conflict between those earlier statements and his more recent claim. “We do believe all the children are ‘most likely’ in the vehicle but cannot rule out other possibilities. This has been our stance since the beginning,” Lt. Barney said in an email. Lt. Barney did not respond to a question about what the sheriff’s office is doing at this time to actively look for the children. In a phone interview last week, Lt. Barney clarified the circumstances of the discovery of human remains found in May, about a mile from the site of the Hart SUV plunge, which authorities believe was a murder-suicide. He explained that a female resident found a shoe with clothing appearing to belong to a female child, and gave those items to a friend of the Hart family who she knew was in the area searching for items related to the fatal crash. That friend of the Hart family reportedly examined the shoe, and discovered skeletal remains inside the shoe. He then gave the remains to authorities; Lt. Barney indicated that the California Highway Patrol was the first to field a report of the remains found. Officer Calvin Robertson, a spokesperson for the California Highway Patrol, said that it was the California Department of Fish and Wildlife that first responded to the scene, reportedly near Hardy Creek and North Highway 1 in Westport, California, following the report of clothing items and possible human remains found. Robertson said that the California Highway Patrol at no time took possession of the clothing items and remains, and that the Dept. of Fish and Wildlife turned the items over to the Mendocino County Sheriff-Coroner’s Office. Lt. Barney told CrimeOnline that his department is not concerned about any possible contamination of the remains, which have not yet been identified. “There is no reason, at this point, to doubt the intentions of the person who found the items or the person who reported them and turned them over to us,” Lt. Barney wrote in an email. Robertson could not confirm how the remains were initially reported, but said it was possible that the Dept. of Fish and Wildlife had responded to a 911 call. A representative for the Dept. of Fish and Wildlife was not immediately available for comment. Beginning in April, CrimeOnline has provided investigators the names of several people believed to be connected to the Hart family, including one person who sources have said was close to the children, and someone they possibly would have gone to in the event of a crisis. According to our most recent information, authorities have not made contact with this person, though Lt. Barney said the sheriff’s office had interviewed numerous people who were familiar with the Hart family. “We have a number of people saying ‘yes,’ there were problems,” with the family dynamic, referring to CrimeOnline’s stated concern that many people who were in the same social circle as Jennifer and Sarah Hart appear to be in denial about abuse allegations against the mothers. Lt. Barney told Crime Online last week that the forensic lab analyzing the remains found in May was unable to make a positive ID when comparing those remains to samples taken from Hannah Hart’s biological siblings who were confirmed deceased in the crash. The sheriff’s office is now working with agencies in the state of Texas, where the Hart children lived at the time of their adoptions, to help locate biological relatives of the children in order to aid the identification process.